If you find yourself drawn to my work I imagine you have a calling to share your gifts and use your voice for the purpose of uplifting others. I imagine you desire to birth something and be a part of the awakening of a new paradigm. Most likely you are tired of pushing, forcing or sacrificing in order to get there. I believe in you stepping into your fullest potential. Financial empowerment. Thriving in your life’s work. And creating space to do what makes you come alive, everyday. I believe this is possible for you. In the last year the qualities of the feminine have been my greatest teachers... The qualities of BEING, FEELING, SURRENDERING, ALLOWING, MAGNETIZING, and stepping into greater TRUST. I know it is not always easy to honor these qualities in a culture so focused on achievement and doing, but I believe the feminine is rising, calling us back into balance as a collective. There are so many of us that are waking up at this time and many of us are feeling called to let go of the old paradigm of pushing and forcing. Many of us are quickly ascending beyond that. So...I've decided to re-release of my most popular webinars from last summer on the Rising Women Leaders Podcast. "In the feminine model, it's all about responding to life with love. And with that we can take the art of manifestation a level deeper, using practices that involve not only our mind, but also our body." As an added bonus, I'm including notes from the webinar for you below! Opening: Deep breaths and welcoming you into the art of receiving. Receiving your breath. Receiving this moment. Femininity and abundance are so much about opening ourselves to receive. Imagine the web of other women here with you tonight. Beautiful women who are here to support you in stepping into your greatness. Women who are invested in you becoming the best version of yourself. We welcome our guides and teachers, anyone that has been important to you in your life. I will call in the feminine teachers I have been working with Amma, the divine mother, Quan Yin, the goddess of compassion, Mother Mary, she of a thousand roses and Mary Magdalene, she of a thousand angels. Close your other windows, close the door, be fully present and stay the entire time…Because: At the end I’m going to give you a practice that you can start using in your life right now that will help you begin to create huge shifts in your life related to inviting in more abundance. I believe in you stepping into your full potential. Financial empowerment. Thriving in your life’s work. And creating the space to do what you love, everyday. And I believe this is possible for you. And you can do it with ease and with grace, Honoring a feminine way of being and living. While I do feel there’s an important place in our lives for structure, action and achievement, if our body starts sending us signals to slow down, I believe it’s important to listen to them. When I found myself with stress, exhaustion, and chronic pain as result of being overworked, I began to reevaluate my life. The yoga classroom became my sanctuary, a space to just be through feelings of stress, difficult emotions and pain in my body. Through allowing myself to feel, and to breathe, without the immediate need to fix or change my life, everything began to shift. Without knowing it, this was my first moment of discovering the sacred feminine, which has become a great teacher to me in this life. Just being, holding, loving myself as I am is such a powerful way of being in the world. Through being, I discovered my intuition, my inner guide, who led me on my path to California, soon after to India, and back to California where I live today. Now living in California, my life’s work is of a coach and a yoga teacher, and I found that my masculine model of pushing and forcing really did follow me even though and there were some challenging moments in my business especially in the beginning. This is what I believe for our creative gifts, that when we honor the feminine we can be patient and surrender, wait for our ripeness, and allow our creative gifts to be birthed through us. The feminine is rising, calling us back into balance as a collective. There are so many of us that are waking up at this time, and we feel a deep calling to join together as a sisterhood in love and support of each other. We are feeling called to let go of the old paradigm of pushing and forcing. Many of us are quickly ascending beyond that. The new way is Abundance is a state of being within ourselves and when we begin to live and breathe it, everything outside of ourselves will mirror that. My Intention today is to help your reconnect to your feminine essence and rediscover the innate abundance within you so you can begin to reflect that in everything around you. ~ Many of you are probably familiar with the teachings of The Secret and The Law of Attraction - it’s based on the idea that your thoughts become your reality, and if we shift our thoughts to think more positively we will attract more positive things in our life. This helped me a lot in my life, but as a culture we have actually accelerated past these level of teachings that are all about the mind - which is very powerful but it does not take into account the power of the womb and the body. These teachings were mostly about enforcing our power of will to command the forces of life to work on our behalf - what it doesn’t take into consideration is life is co-collaborative we are not always responsible - if something bad happens we think somehow we created it and are getting it wrong - we can actually feel ashamed like it is our fault which can lead to shame and self-blame. The truth is life is always in every moment happening for us, not to us. And when we look at the model of the feminine it is very cyclical — we are living a human experience - there are times of expansion and contraction - your spiritual path is not about how great you are manifesting but how you are responding to life. How you respond to what you are presented with. Sometimes bad things happen. But if you can really truly love yourself through those hard times, that is going to evolve you so far and you really open yourself to miracles. 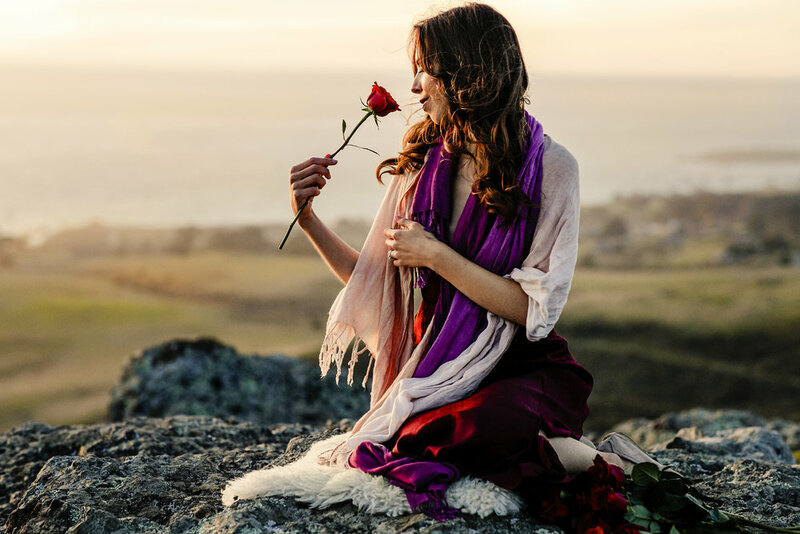 The feminine model of manifestation the power of our thoughts are helpful, but it actually goes beyond into using your body, your womb and responding to life with love. I’m going to share with you as much as I can today, and for those who want to go deeper, you’ll hear more about how you can do that at the end of the call, so be sure to stay for that. Take a moment to meditate/journal - what is it I truly desire? What does my heart really long for? Who is my higher self? 1. Connect to Your Higher Self - Higher self meditation - how can I be more of this person right now? When I first did this meditation I imagined the kind of home this woman lived in, I saw that she wore organic clothing, lots of light colors, she meditated in the mornings, her home was minimal. I began making decisions based on what my higher self would do. What she would buy. And at the time it felt really far off but little by little I have been watching myself become more and more of her each day. As soon as we tell the truth there is more space. Accepting our truth - we create the space for something new. Story - Last spring I wrote a letter of acceptance. I wrote out all the things that were not working in my life and I started it with I accept. I was having health challenges, some relationship challenges, money challenges, and I just wrote it all out. I accept that this is going on. I actually found this letter yesterday, and so much of what I was writing there has transformed. Taking the space to acknowledge and accept what was not working in my life was incredibly liberating, and taking that step actually created the space for everything to change. Around this time, I found the book the Life changing magic of tidying up and I went to work. When we declutter our lives we actually create more space to receive. Face yourself with everything you own and ask - Do I love this? Does this spark joy? Does this represent who I am today? There is a true alchemy that happens when we let go of what no longer serves us in our surroundings. It clears stuck energy and frees up space. The funny thing is before I found this book I kept telling myself - I need a bigger home - I don’t have enough space, and I was driving myself crazy looking for a place to move. Now actually when I went through this book and cleared out so much, I suddenly stopped feeling that aching desire to move to a bigger house. My house transformed so much. It created new possibilities and my partner and I actually created an outdoor bathtub which we have been using so often. My home has been becoming more and more of a sanctuary. Let money flow - Find a balance of saving and giving. Connect with your body and spend money on things your heart lights up about. That money will come back. TRUST. The Queen is a leader, she is sovereign, powerful, autonomous. But she is absolutely of service. She puts aside her fears in service to her people and something so much greater than herself. Much of my path has been about trusting in my voice. I have worked through some really tremendous fears and doubts around trusting myself and my voice. And I have known that this fear has absolutely been calling me deeper into my purpose. So what has really been helping me is the mantra: I am a Queen. I trust in my voice. Now when I step more and more into the role of the Queen, when I follow my intuition and I really deeply trust in myself, abundance follows. This requires moving beyond our fears. This requires taking up more space. There is an immensity of power that comes with being a Queen and as a Queen we accept that power. We step closer to our edge. We honor our power. And when we do that, abundance comes. How would a Queen treat herself? ~ Body wisdom practice - Abhyanga - self oil massage - actually being aware and conscious and speaking to your body. I love you. Thank you. You matter. I bless you. Wow this practice has felt so loving, and literally makes me feel like a Queen. ~ Feed yourself delicious meals, take care of your body. ~ You are done with trying to fix your emotions and you are willing to feel them. That is the true invitation of the feminine to take her place in you. The feminine is all about wrapping her essence arms around the parts of you that feel separate or split from their wholeness so they can be loved back into being. ~ Story of Vipassana Center, I’ve been with my beloved for about 5 1/2 years, and for the last year I’ve had a pretty strong desire to get engaged. Vipassana Retreat - realized I was thinking about it so much - I was putting so much of my attention and energy on something I didn’t have, I was putting pressure on myself to make something different than what it was, and I realized the absolute misery I was putting myself through. So much about the vipassana practice is about PATIENCE. I allowed myself for hour after hour to be with my breath and I had a visceral experience that I was the cause of my own misery. I was causing my own suffering by focusing SO MUCH on what I didn’t have. Cried for a long time in one of the silent meditations because I just felt so sorry - I realized I had such a loving partner and the things I loved most about him and our relationship was: sharing our dharma of teaching and singing together, of spending time in beautiful natural environments and going out to dinner sometimes - that was what brought me true, genuine happiness. I realized instead of focusing on what I didn’t have that was what I needed to focus on. When I did, our joy increased our relationship strengthened, and low and behold 3 months after that retreat, my partner proposed to me. He was honored and went with him wondering what dance/instruments he would use. He got to the top and stood with his palms open - 5 minutes passed and he said - ok we’re done, let’s go. What did you do? I felt the rain on my skin, I felt the puddles beneath my feet. I felt with all my senses. So I know I shared a lot today, a lot to practice and to implement. Now some of you may run with the information and start using it and create huge shifts in your life - and I also imagine there are some of you that want to go deeper. You want community, you want a guide. You want the support and the accountability of a mentor. May we join together as the sovereign women we are. May we honor the light within our heart, and step more and more each day into the role of our highest selves. I honor you sister for being here with us today, and I bow to you Namaste.